June 8, 2015Are Elephants Capable Of Empathy? April 19, 2016The Allen Funt Hijacking Incident. Just Another Prank? In 1988 NOAA scientists predicted a section of the Pacific Ocean would contain plastic marine pollution drawn there by converging ocean currents. It was later proven that the prediction was correct and the area is generally referred to as the Great Pacific Garbage Patch. The garbage island as it’s sometimes referred is not exactly an enormous trash dump in the ocean as the name and reputation often lead people to imagine, but it is a serious concern. Most of the debris are suspended below the surface of the water and are small disintegrating particles. This makes it hard to determine the exact size of the garbage patch, and makes it impossible to see from aircraft or satellite. The only way it can be measured is by physically sampling the ocean waters using nets. Though the garbage patch is hard to see and measure, it is believed to be anywhere from several hundred to several thousand miles wide. Depth is another concern. Scuba divers armed with dive knives, have explored some of the area in order to ascertain its size. Alarmingly, it has been reported that below the surface the patch could be as much as 100 feet deep. This doesn’t include the particles that sink all the way to the ocean floor. There are actually multiple garbage and plastic patches or gyres within the Earth’s oceans. The Great Pacific Garbage Patch (also known as the Northern Garbage Patch or Eastern Garbage Patch) is only one of two within the Pacific Ocean and it’s location shifts throughout the year as the currents change. The other patch of pollution in the Pacific Ocean is is the Western Garbage Patch. The Atlantic Ocean is also known to have at least one garbage patch. Efforts to clean up the mess have not got past government boardrooms as yet, however one only need to think what it would be like to sail through all of this. Whether on a large ship or a small trolling motor boat, the sight would be heart wrenching – and you would have to ask yourself, just what are we doing to our planet? De-mystifying the “Great Pacific Garbage Patch”. Marine Debris Program, NOAA. 19 July 2012. Overview: Contains a frequently asked questions page with information gathered by NOAA scientists and partners. Also includes a basic map of the patch locations. 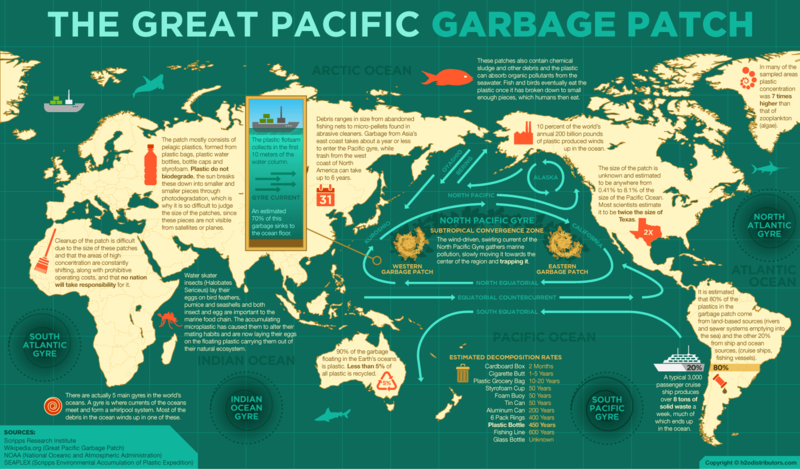 The World’s Largest Dump: The Great Pacific Garbage Patch. Thomas Kostigen, Discover Magazine. 10 July 2008. Overview: Includes some information about size, though the size is hard to know for sure.